The Hassayampa river Run February 1 at leaving at 9 AM. The Hassayampa River run starts at the waffle House at 83rd Ave. and McDowell we leave from there drive up to 339th Ave. Turn right to McDowell Road then we then take McDowell Road to the bottom of the Hassayampa River most non-Street legal vehicles meet us at this point. 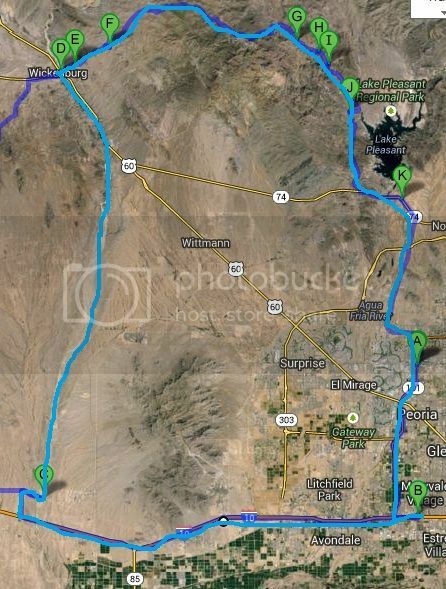 Then we drive up the Hassayampa River to Wickenburg the non-Street legal vehicles will turn around and go back down the Hassayampa River run while the rest of the vehicles going to Wickenburg for lunch then we take the constellation mine Road over to the Castle Hot Springs Rd. then exiting at the lake pleasant recreation area. This is a very easy run a stock Baja can easily make this event. See Ya in the dirt! How many round trip miles is the run? I don't know.. never thought about it. 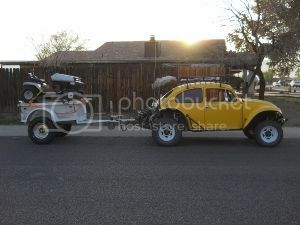 My Brother-In-Law and I will be there in his Baja. If this is the route we are taking it is about 150 miles round trip. most of the riders get gas in Wickenburg so running out of gas has never been a problem on this ride. I'll see you all at the Waffle house on 83rd. On the way out though I am going to turn off onto Miller and take the dirt to the river, been way too long, can't wait! This sounds like a great idea!! some of us can make this run into a campout. see ya in the dirt. Glad you found out the problem with your front end. I hope you met up with the group in Wickenburg. Thanks to Kenny for trying to help me with my rack and staying behind with me until I gave it up. Hope he caught up and had a good run with the rest of the group. I really hated to quit but the stupid rack has been a problem on two runs lately but won't be on the next one. I still had a good time what little part of the run I got to do and hope to see all again .